Hello All, I am Abby, your new Thursday editor. This is my 1st of many Thursday, Dia de la Abby, weekly posts to come. Following in the skull steps of Noah, Tatman and Citizen Agent, by making skull themed art and posting it for all of you to enjoy. I'm highly influenced by Dia de los Muertos...hence the "Dia de la Abby" name...which was Citizen Agent's idea. Expect to see lots of Mexican related art in various different mediums, as well as some inspired by the Skull-A-Day 1.0 project that lead this. Enough with the introduction, time for the good stuff, the art. As I mentioned before, I'm highly influenced by Dia de los Muertos/Day of the Dead. My favorite thing or really the thing that attracted me to learning more about this fantastic holiday, is the beautiful sugar skulls that are made as treats. I love the details and bright colors used to create the tasty works of art, so I have translated that into a more long term piece using colorful tissue paper and black card stock. This piece is also influenced by Noah's Quoth the Skull cut paper piece, which is my all time favorite of his monumental amount of work and will soon be a tattoo...which is a dedicated sort of love...just like being an editor on Skull-A-Day is. 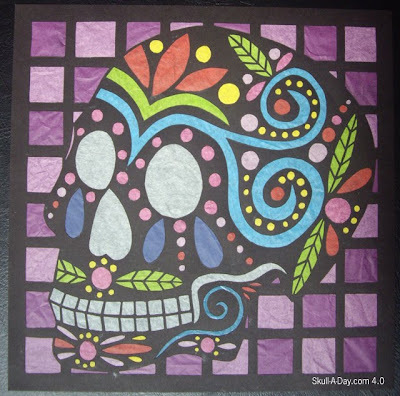 Since I love sharing art and how to make things, here is the Cut Paper Sugar Skull tutorial. Welcome Abby! I look forward to your creations... and bugger it all, another art/craft blog(yours) I need to check out routinely! Excellent work for your first post. 51 more weeks of great stuff to come. Glad to see you got it started right. It's a gorgeous piece! And I love that you are providing the DIY instructions too! I love how colourful this piece is, too! I look forward to enjoying your weekly contributions.